Before actually binding your F&Gs, you now must sew them all together around strong, 1/4″-width linen tapes (ask for bookbinding tape at your local craft store) at the spine. 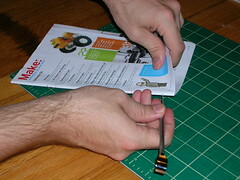 This process creates the added durability offered by a hand-bound book. Using three tapes, running perpendicular with the folds of the signatures, provides for the strongest spine. 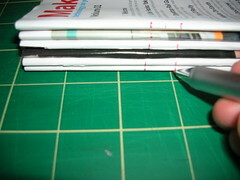 With your ruler and pencil, make eight marks along the fold of the first signature. Make your first mark 1/2″ from the head of the signature, and make another 1/2″ from the foot; these marks will hold the kettlestiches (the points where one signature is sewn to the next). The other six marks represent the points where you’ll sew around the tapes (two marks–an in point and an out point–for each tape). Keeping these marks in pairs just a fraction wider than 1/4″ (to prevent puckering around the tape when you sew around it), space the three pairs evenly between the two kettlestitches. 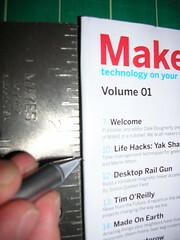 Stack the remaining signatures to make the same marks, at the same measurements. Use a medium-duty awl to pierce through the marks you’ve made in each signature. The holes should be just wide enough to allow a needle to work its way through, keeping the thread as snug as possible against the hole; don’t create a huge opening. Now, you’re just about ready to sew. Though using a stitching post is not absolutely necessary (as long as you keep a steady hand, make sure the tapes remain taut, and ensure that the signatures stay even while you sew), it does keep the work organized and easier to manipulate with the only two hands you have. 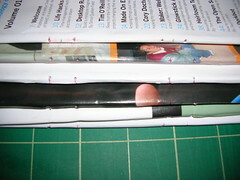 If you have one available, set it up with the tapes stretched tight and spaced to match your holes. If you’re stitching freehand, simply line up the tapes as you stitch; keeping in mind the way they look when attached to the stitching post should help visualize the goal you’re looking for. 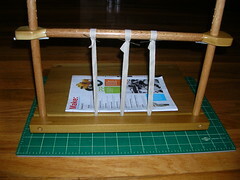 for a DIY sewing punch and sewing method using draughtsman’s clamps.